Philippines - The Smart Communications, Inc. announced their very smart promo about the Free 3 titanium tickets to the One Direction - "On the Road Again Tour" on March 21, 2015 at the SM Mall of Asia concert grounds. How to get a chance to win those 3 tickets? please find it now after you scroll down the page. 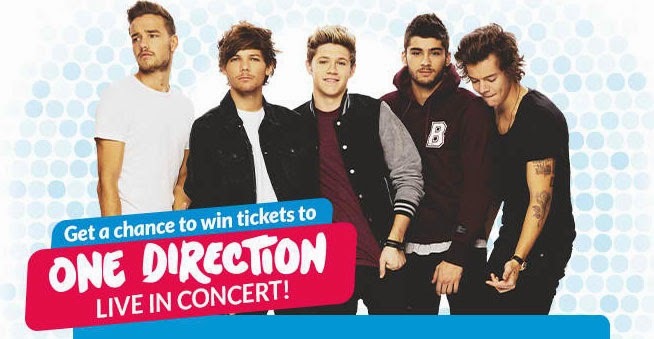 The #Smart1D promo is open to all new and existing subscribers of Smart. Please be advised that the promo period is from September 1, 2014 to March 6, 2015 only. Every approved plan will get three (3) lines and three (3) phone under one account. The Plan 900 subscribers will get 1 raffle tickets while Plan 1800 will automatically get 2 raffle tickets. There are only thirty (30) winners, each winners will get 3 Titanium Tickets to 1D concert on March 21, 2015. They're will be notified through Smart special access #7777.
will facilitate the draw at 10AM each month. For unclaimed prizes within the redemption period, SMART will be forfeited the prizes with prior approval of DTI. If you like to apply this SMART Family Ties Plan, just simply go to www1.smart.com.ph/postpaid/promos/one-direction, and see the Individual Application Requirements for more details. DISCLAIMER: The promo details given to this article is solely owned by the company mentioned. Any information given does not belong to the writer. Please do refer to the given link for more ads and infos. Comments or suggestions about "Free 3 Titanium Tickets to the One Direction Manila Tour 2015 - #Smart1D" is important to us, you may share it by using the comment box below.